(LWI) - Support to nursing mothers and their babies is one of the approaches that the Lutheran World Federation (LWF) uses in Uganda to ensure nutritious diets, healthy lifestyles and sustainable livelihoods for both refugees and local communities. Participants in these initiatives include Joyce Tuhaise, who came into contact with the LWF after her first child was born at home in Kyangwali settlement, western Uganda. She recalls, she had to wait for an hour before breastfeeding the newborn although the baby was wailing. “This made me uncomfortable, but I had to wait since our cultural norms forbid us from breastfeeding in the first hour,” Tuhaise says. Then she nursed her baby girl Sara, but only for the next four months as she was not producing enough milk. With limited income, the young Ugandan mother had no other option but to feed her baby cassava porridge. Then the baby’s health started deteriorating. “Sara became thin and experienced recurrent episodes of diarrhea, which made her very weak,” recalls Tuhaise, adding that visits to the doctor were not providing any solutions. During regular community prevention clinics for children, LWF’s nutritionist Bella Kyarisiima, noticed that Sara, then one-year old, was malnourished. She explained to Tuhaise why a newborn baby needs to be breastfed exclusively for six months from birth because its digestive system is not yet fully developed. Breast milk also helps to boost immunity against disease. “Breast milk is nature’s perfect food for babies. It contains the perfect mix of fat, protein and carbohydrates for the baby’s developing physiology. Breast milk meets all the baby’s nutrient needs; no other foods or fluids are necessary,” said Kyarisiima. Tuhaise also received advice on hygiene, nutritious food for a baby and lactating mother, and how to prepare them. “We ensured that baby Sara was admitted to Kyangwali health center to receive in-patient therapeutic care. We also offered her nutritious food such as corn soy blend through the Maternal and Child Health Services (MCHN) program,” added Kyarisiima. 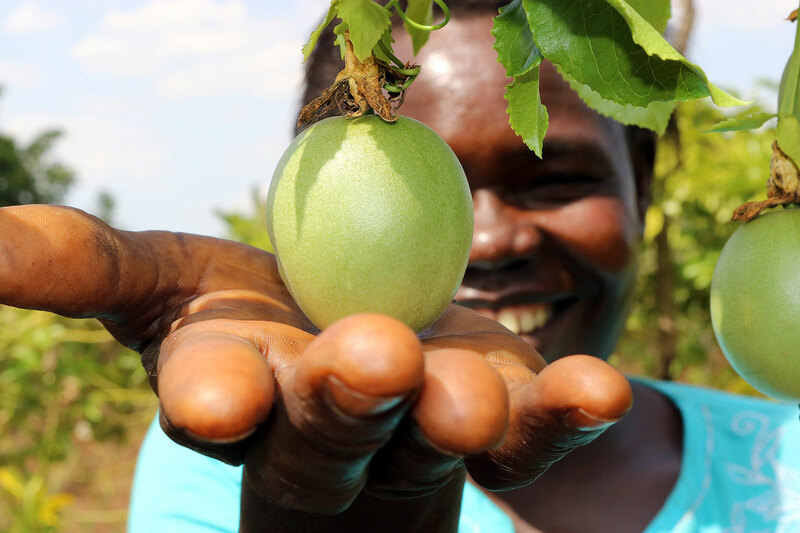 Beatrice Akello displays a passion fruit in Pader district, where the LWF supports and promotes production of high-value crops to ensure its targeted communities have adequate nutritious food. The LWF nutrition team continued to visit Tuhaise and baby Sara to ensure that the child stayed on a healthy path. At 13 months, only five weeks after she had been diagnosed with acute malnutrition, Sara weighed eight kilograms, which is normal for a toddler of her age. These interventions are life-saving for babies like Sara and heartwarming for mothers like Tuhaise, who says she wants to see every child in the refugee settlements grow up healthy. “My baby is perfectly fine. The diarrhea episodes are history and I also have enough breast milk to feed her. I pray that nutrition services reach more homes in Kyangwali, because if they do, more lives will be saved,” Tuhaise concludes. I pray that nutrition services reach more homes in Kyangwali, because if they do, more lives will be saved. Sara continues to receive nutritious supplementary food and the LWF teams also ensure she is on track to complete her immunization schedule. The MCHN program is part of LWF Uganda’s humanitarian support toward vulnerable communities in the country. In Kyangwali, which is inhabited by both locals and refugees, one of the objectives is to prevent and mitigate malnutrition among children. With funding from the World Food Program, more than 9,000 refugees from the Democratic Republic of Congo (DRC) and host community members have received health and nutrition assistance, including establishing kitchen gardens at the settlement. The LWF extends humanitarian support to both refugees and host community residents for water, sanitation and hygiene needs, and works with the locals on issues such as protection, livelihood, environment and energy, community services, shelter and construction. In 2018, LWF’s work in five districts in Uganda ensured that over 640,000 refugees mainly from the DRC and South Sudan, and host community members received life-saving assistance aimed at building people’s capacity and competence to positively change their lives, utilizing both cash and non-cash interventions. The LWF’s humanitarian intervention in Uganda began in 1979. The country program’s work focuses on internally displaced people, returnee integration, sustainable livelihoods, community empowerment, human rights, malaria and HIV and AIDS.